Political memoirs are typically written by people toward the end of their careers. But the 10 young women who served in the Obama White House recently released the book, "Yes She Can," showing how even junior staffers can have influence and inspire others to become public servants. 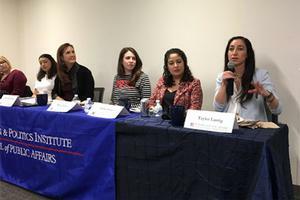 “We wanted to talk directly to young women coming up after us to say that careers in government are a good way to make a difference,” said Molly Dillon, who served as a policy advisor for urban affairs, justice, and opportunity in the Obama administration. Six of the book’s co-authors spoke at an event on campus recently to talk about their New York Times bestselling book. The event was organized by SPA's Women & Politics Institute (WPI) and moderated by WPI’s Executive Director, Betsy Fischer Martin. “What comes across in the book is their dedication to public service,” said Fischer Martin about the women from diverse backgrounds who were all in their 20s when they worked in the administration. They were teens when Barack Obama announced he was running for president. They came of age in the Obama Era. And then they joined his White House. Smart, motivated, ambitious–and ready to change the world. Jenna Brayton, an author on the book and SPA adjunct professor, spoke about being an early fan of Obama in her home state of Illinois and her lesson of persistence. She relentlessly called the campaign office until she got an interview and showed up covered in Obama buttons, layered T-shirts, and even pants with his image. After graduating from college, Andrea Flores was eager to take a job in Washington but worked first in her home state of New Mexico. She credits the experience with giving her the background she needed to be on the immigration and rural affairs team in the White House — and to be resilient when policy setbacks happened. “Sometimes you show up, work really hard, and change doesn’t come, but you continue to support the movement as you can,” said Flores. Eleanor Celeste said she grew up in a political family in Ohio where public service was “cool,” and, for her, it was just a matter of how she would serve. Ultimately, the co-authors hope attracting more women into entry-level staff positions may give them the confidence to run for elected office. They also emphasized the value of service at the local and state level. "Yes She Can" is a look at the Obama administration through the eyes of successful, and completely relatable, young women. Full of wisdom they wish they could impart to their younger selves and a message about the need for more women in public service, these recollections are about stepping out into the spotlight and up to the challenge – something everyone has in them to do.